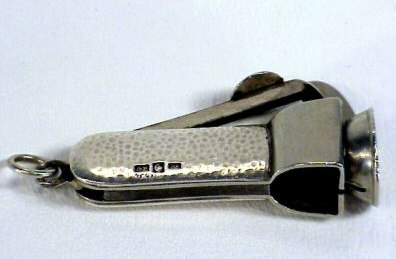 this silver cigar cutter was made in Germany about 1930. It has hand hammer effect on the body with a loop for hanging on a watch chain, The cutter has silversmith's mark LA, the German national hallmark ' crescent moon and crown ' and ' 800 ' for purity degree of silver. 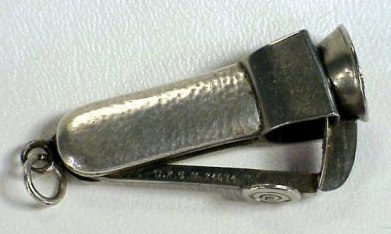 The other mark on the cutting device is D.R.G.M. 24674 which stands for Deutsche Reichs Gebrauchs Muster which means German Empire of use pattern. This mark is like a patent mark on American goods. The cutter is 2 in. long (cm. 5) and was bought by an US dealer through the Internet.